A Texas ranger (Tom Mix) searches for his sister (Beatrice Burnham) and niece (Seessel Anne Johnson), who have been kidnapped by a ruthless lawyer (Warner Oland). According to Wikipedia, Riders of the Purple Sage (published in 1912) is not only Zane Grey‘s “best-known novel”, but it “was one of the earliest works of Western fiction, and played a significant role in popularizing that genre.” As such, this silent movie — the second cinematic version of Grey’s novel — is an especially fitting choice for film fanatics wanting to see early Western star Tom Mix in action. 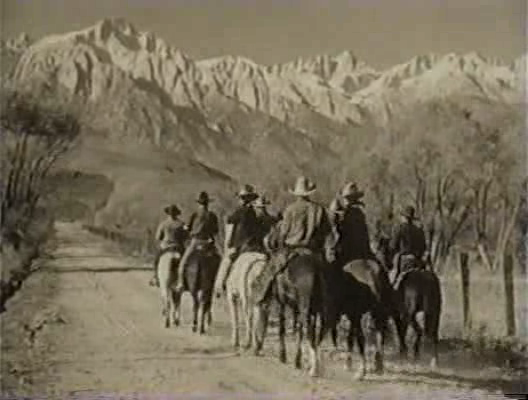 The story itself, running under an hour, is standard melodrama, and not really worth elaborating upon; what one should pay attention to is Tom Mix (regal in his all-black cowboy’s outfit) coming to save the day, and the beautiful location footage surrounding him (shot in Lone Pines, California). Watch for Warner Oland in a pre-Charlie Chan role, and Anne Shirley in a small role as Burnham’s teenage daughter. Yes, simply to see a representative Tom Mix western. Listed as a film with historical significance in the back of Peary’s book. First viewing. Not must-see, except for western lovers who have a keen interest in the history of the genre. Regular film fanatics are likely to have a ‘ho-hum’ attitude. It’s not a bad film, overall (and the last 10+ minutes are well-handled, even if the final conclusion doesn’t really make complete sense) – but it’s not all that memorable either.